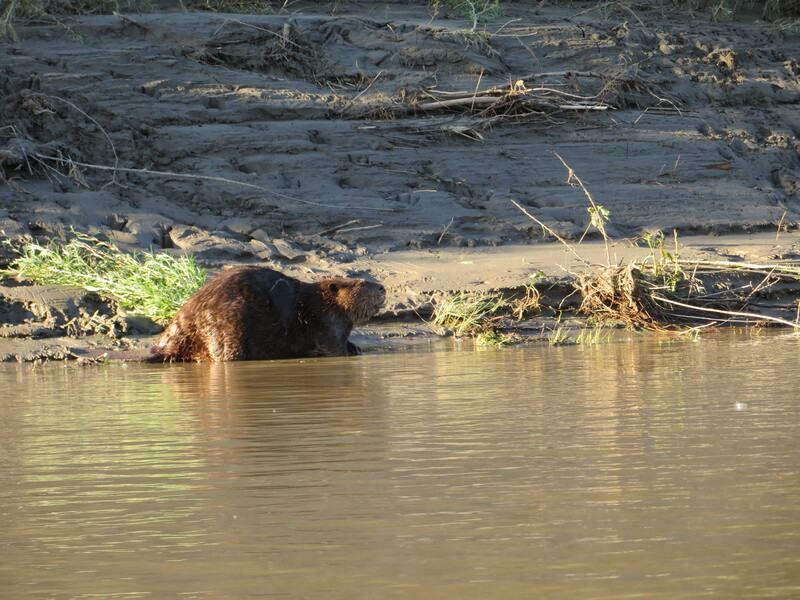 Plenty of beavers in the refuge. And, they are BIG! They pretty much own that refuge. 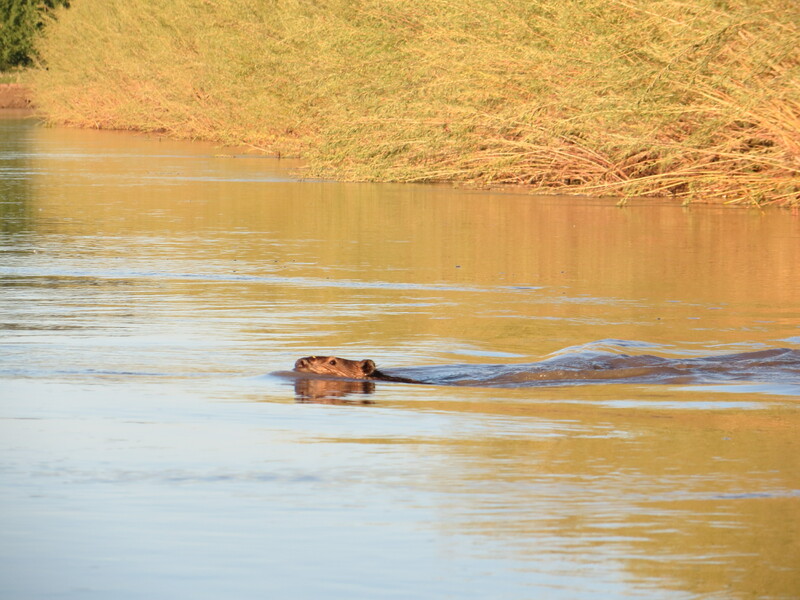 A beaver swimming out to size me up. I’m ready for their water slaps these days. I’ve seen and heard many of them trying to warn me not to mess with them or their dens. 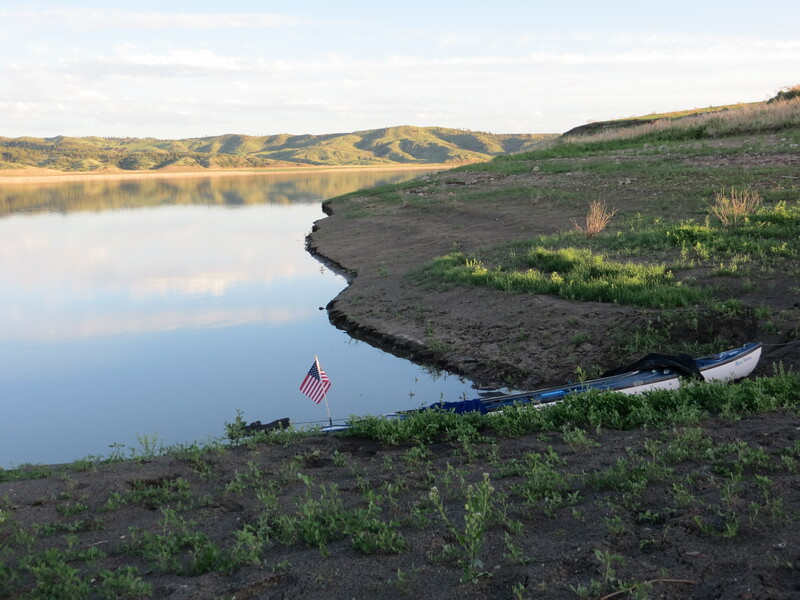 I hated to leave the Roundup boys without saying good bye, but I had to get on the water early in order to make it through UL Bend on Fort Peck Reservoir, approximately 48 miles away. UL Bend is the river-to-lake transition area, and not without its challenges. I was packed and in my boat at 7:00 AM. As I was pushing off, Eli appeared on the shore. I was so happy because I got to say good bye. I also let him know that I left my card on the ice chest for him. It is always bittersweet leaving new friends and river brothers. These boys, young men, are my river brothers. I packed up early and was on the water at 7:00. The air was still, but the banks were muddy for miles. I was extra thankful I had found the RoundUp Boys last night. Nowhere to pull over for miles and miles. 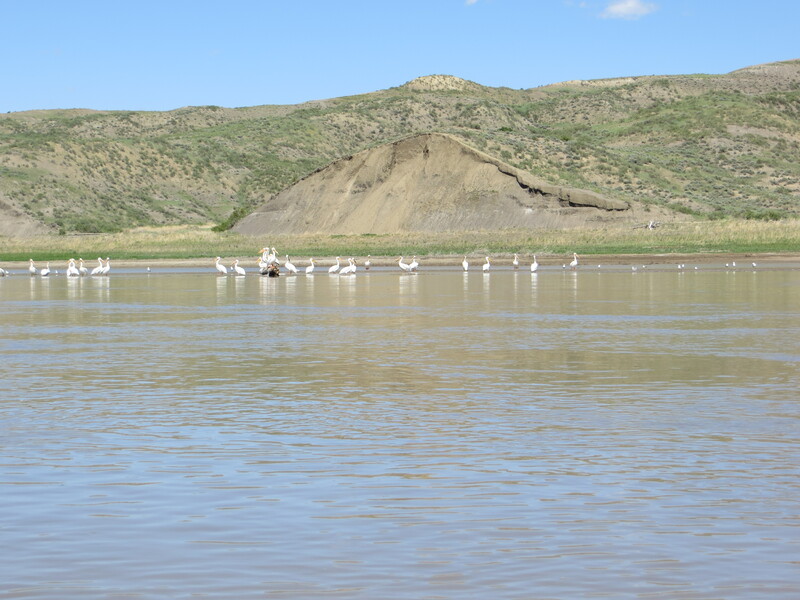 This was a typical site for many miles of the river below the Breaks, and in the refuge. There was nowhere to land the boat, let alone camp. Thankfully, the glassy conditions helped me to paddle 10.5 hours and 48 miles this day. The relentless rain in the previous weeks had saturated the land. 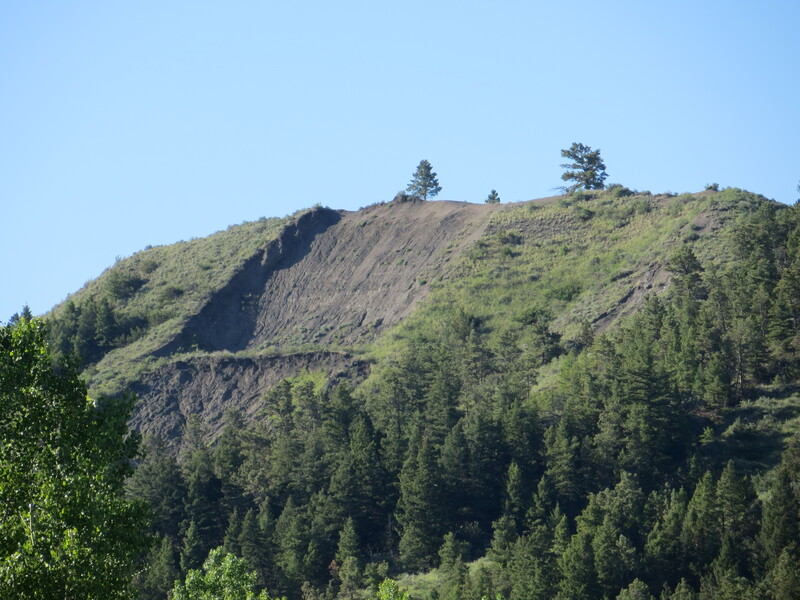 This big landslide had occured recently. On the approach to the lake their were numerous springs flowing into the river. I enjoyed a warm and beautiful day with glassy waters all day. 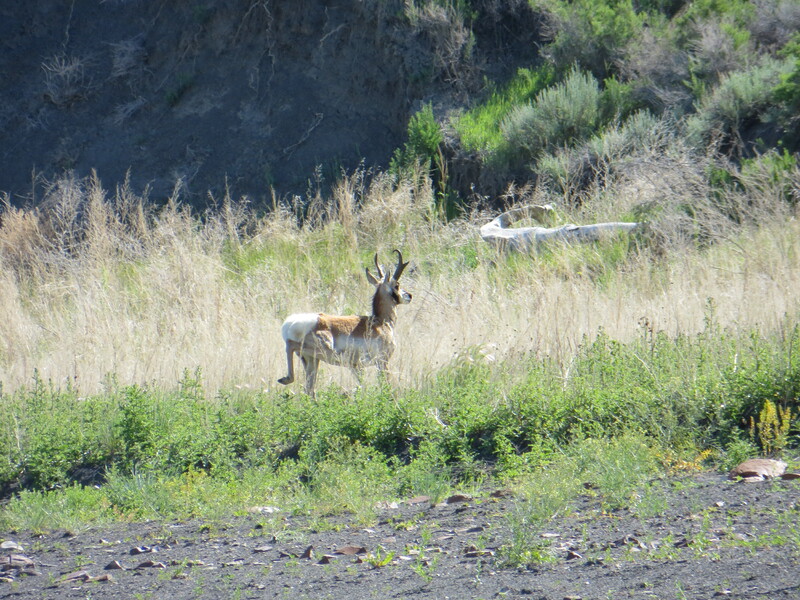 This is a gorgeous Pronghorn deer buck, also known as an antelope (but there is some controversy about that). He had a herd of six females with him. He was not comfortable with my presence. 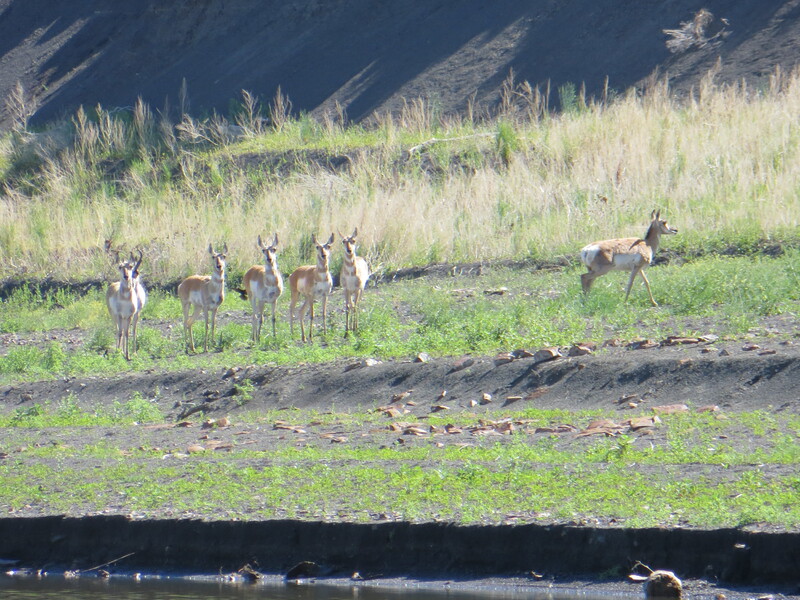 Here is the buck’s females (I assume they were all females). The buck was very protective of them and they were very obedient to his signals to stay clear of me. I was so happy to get pictures of these beautiful animals. This smooth oval rock struck me as peculiar sitting at the base of a dark muddy-looking hillside. 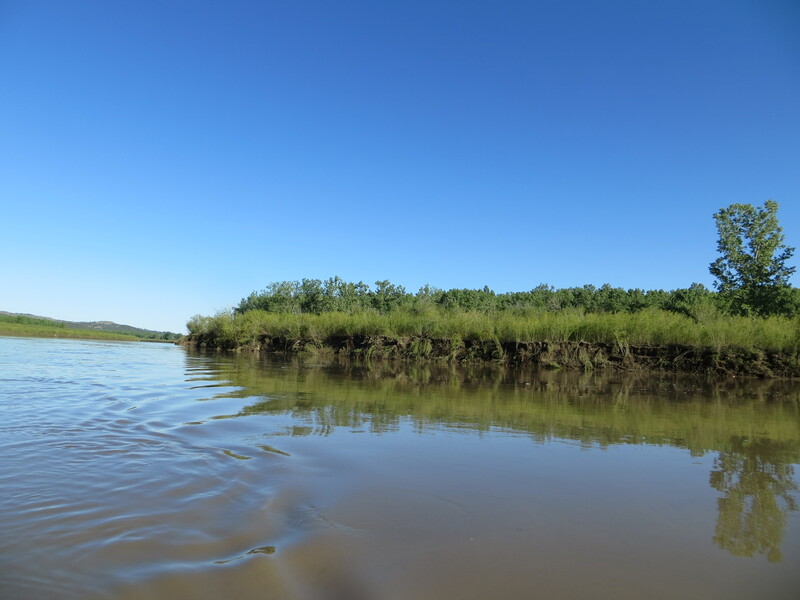 These river-to-lake transition areas are kind of spooky because the river shoreline slowly disappears into the water and before you know it, you are out in the middle of a lake. This can be daunting if the wind is blowing. 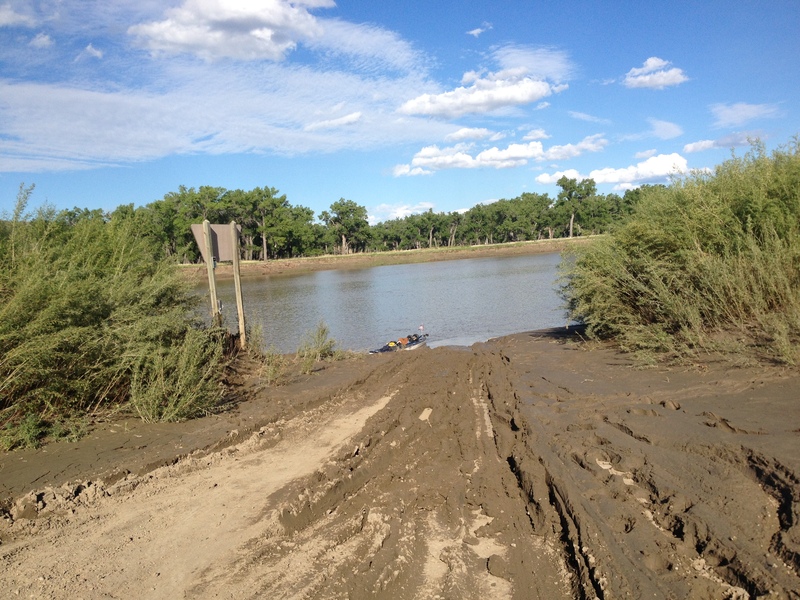 Fort Peck Reservoir’s transition section also has shallow sand bars and mud to deal with. Thankfully, I was somewhat unaware of these things or else I would have been intimidated and stressed. They say ignorance is bliss. In this case, this was true. It did not take long, however, before I realized I had to pay close attention so I would not get stuck on a sand/mud bar. 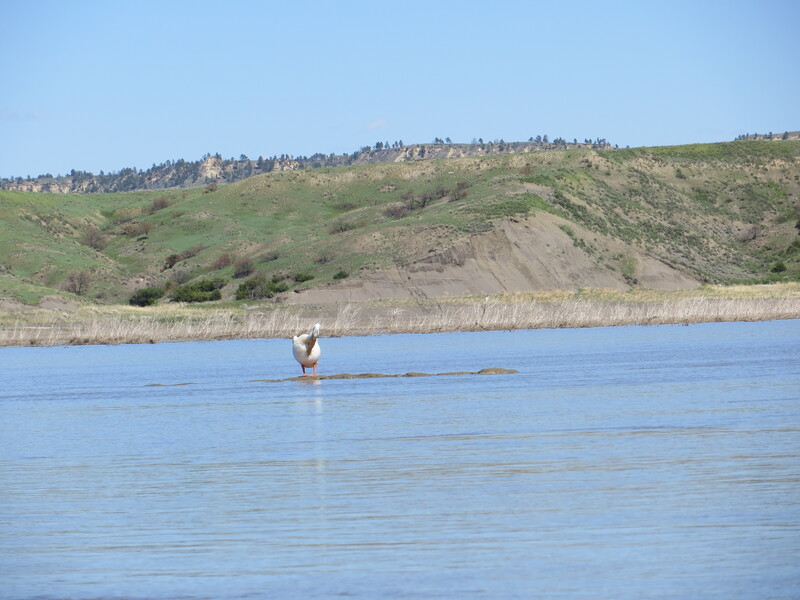 These pelicans were a good indication of shallow waters around me. Pelican sitting on a sandbar that was just barely showing. 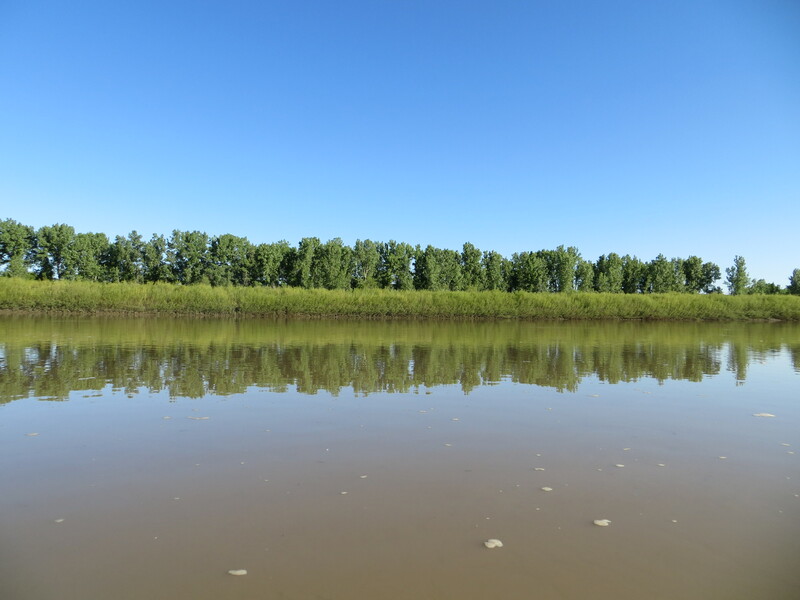 Once the shoreline has disappeared, it can be very difficult following the channel of the river, especially when the current is slowing down and spreading out, and the river transforms into a lake. 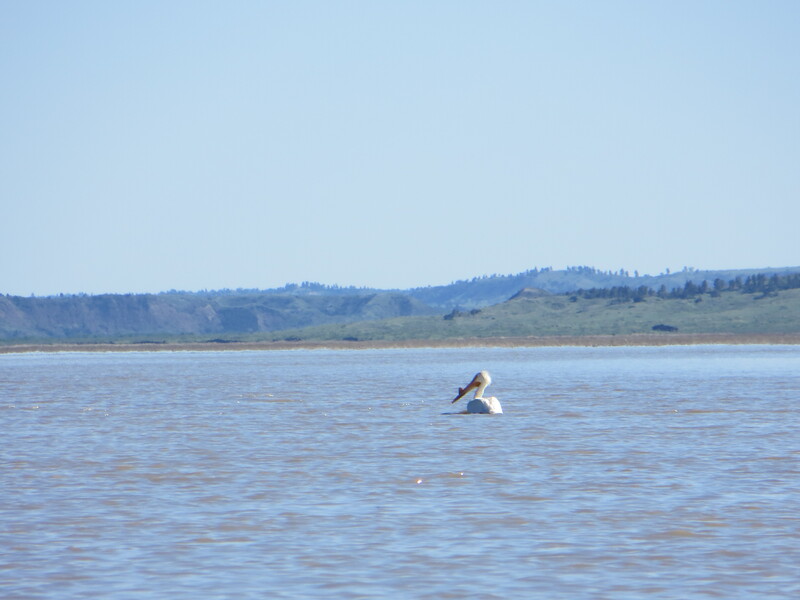 This pelican, I believed, helped to show me the way and I made it around the daunting UL Bend to a campsite. This was my river angel. Once the shoreline disappeared, this guy led the way for me when I found myself in the middle of a lake with shallow sand/mud bars all around me. He was a guiding white light for me, and one of the reasons I hold pelicans dear to my heart. 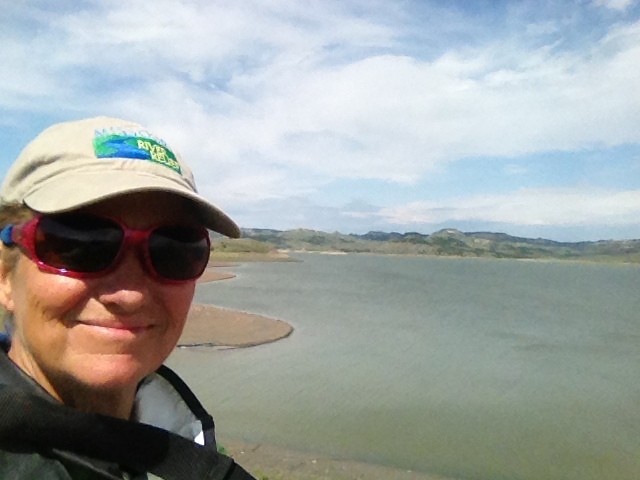 I made it to Fort Peck Reservoir! I paddled 48 miles for 10.5 hours. This was a really productive paddling day and, boy, was I tired, but very very happy. I was especially joyful because my campsite was not muddy. Well, not too bad, anyway. 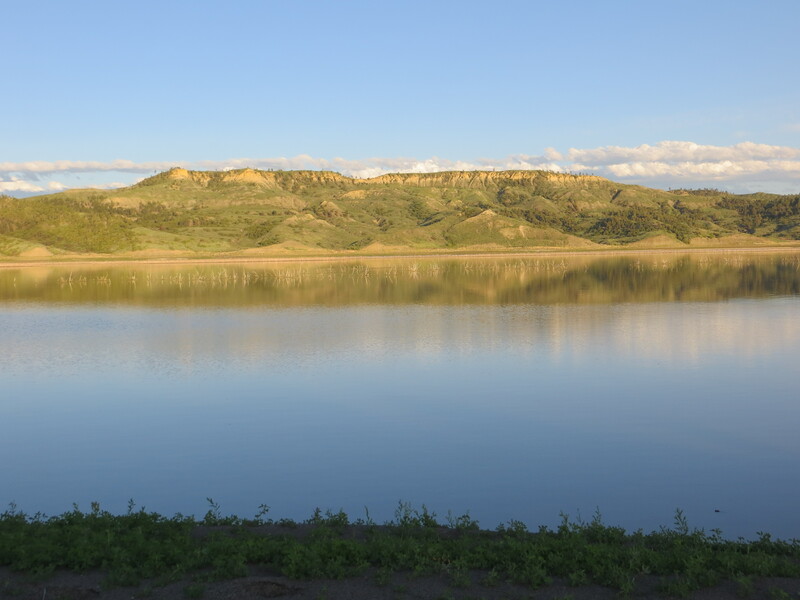 My first campsite on Fort Peck Reservoir, photo taken from my tent. I took a sponge bath here and washed some clothes. I was feeling really good. Later this evening I witnessed the power of a northerly squall line coming across the lake. I had been warned about sudden fierce winds coming out of nowhere. Thankfully, I was safe on shore with my tent and Blue Moon secure. At first it sounded like a motor boat across the lake, then it grew louder like a truck, then a train, and finally a jet plane. It was awesome to watch the wind line move rapidly over the water toward me. I knew what was happening, so I was intrigued, rather than fearful. Seeing this occur helped me to be cautious, aware, and respectful of the wind and water while on this lake. A northerly wind appeared suddenly and engulfed the entire lake near me. Paddlers must keep one eye looking toward the north at all times. 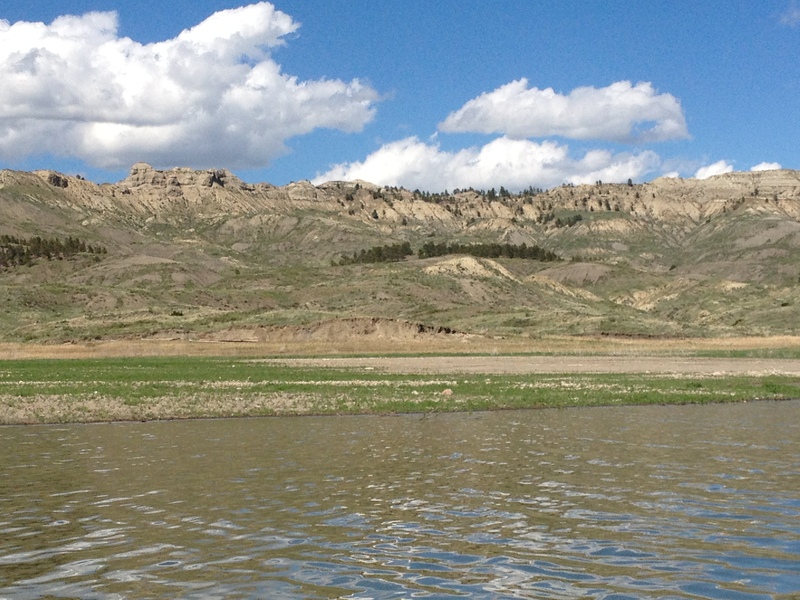 I left the RoundUp boys on June 9 and made camp the same evening on the Fort Peck Reservoir 10.5 hours later. I would journey across this 135-mile lake for the next eight days. A lot can happen in eight days. I was immersed in wilderness and forced to use my own judgment and decision-making skills in order to progress safely to the dam. 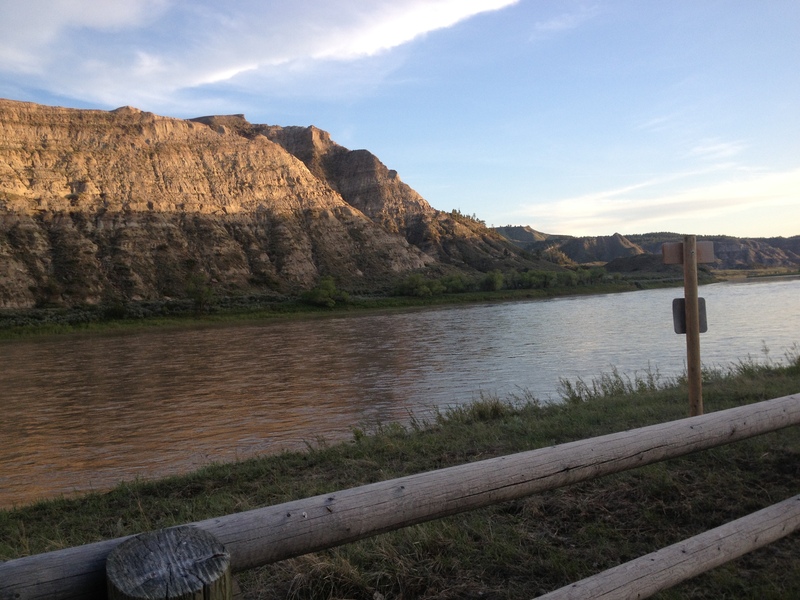 High winds, snakes, electrical storms, wildlife, zero cell service, hours of waiting out the wind, picturesque scenery, and the giving hearts of the few people I met would make this one of my most memorable experiences of my life. 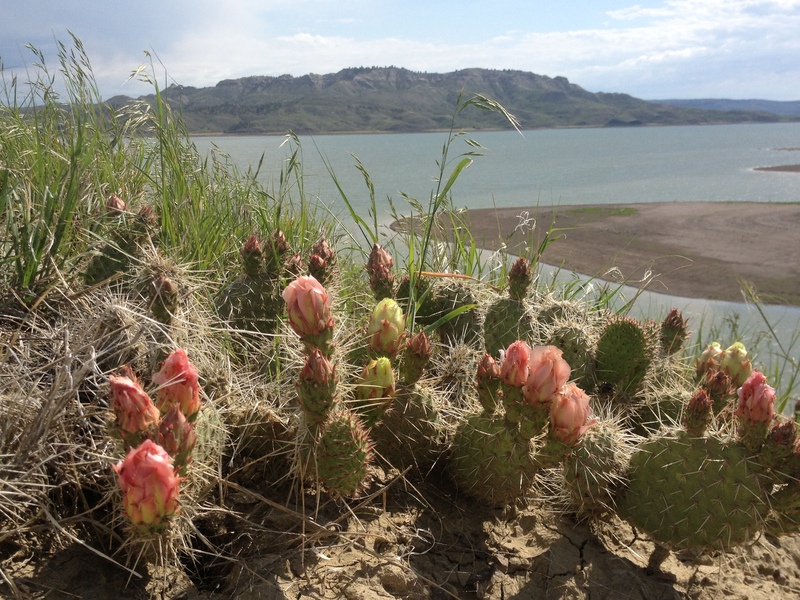 Stay tuned for part two, the next eight days to Fort Peck Dam, through some awesome and incredible wilderness. I decided not to stop at Judith Landing, the approximate middle of the Breaks. I regret that move a little, but I was yearning to get in some solitary camping. I knew that all of the others on the river were getting out at Judith because of the James Kipp closing, so I kind of felt that I would have the lower section to myself. 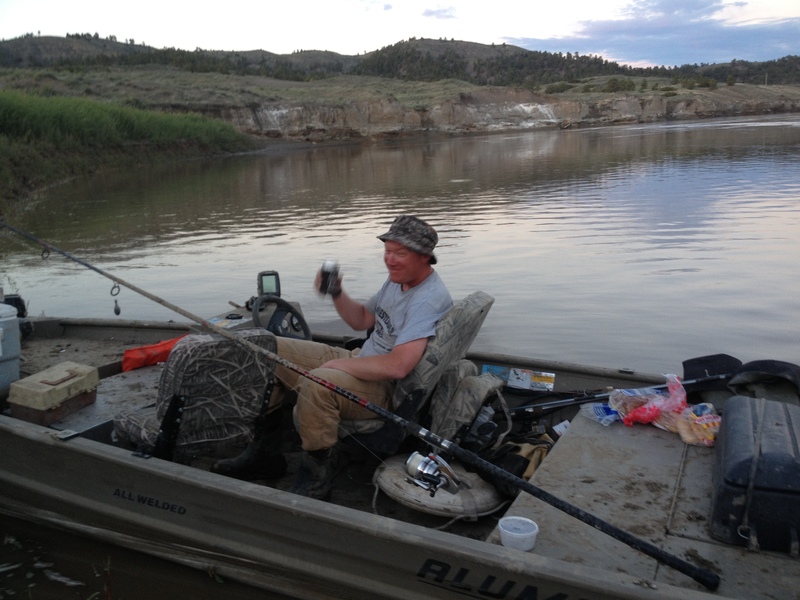 I saw James and Klaus loading up at the Judith Landing boat ramp, and we were able to wave and say our last good-byes. I decided to camp at Gist Campground. I was right. No one was around beyond Judith Landing. 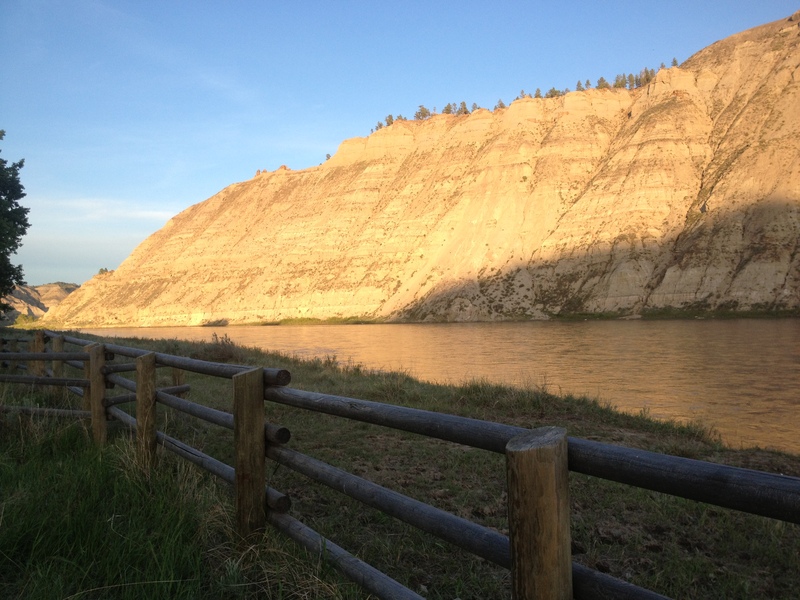 The campground was located on a beautiful stretch of river with a steep rock wall that plunged straight down into the river. I knew then that I was going to like this place. 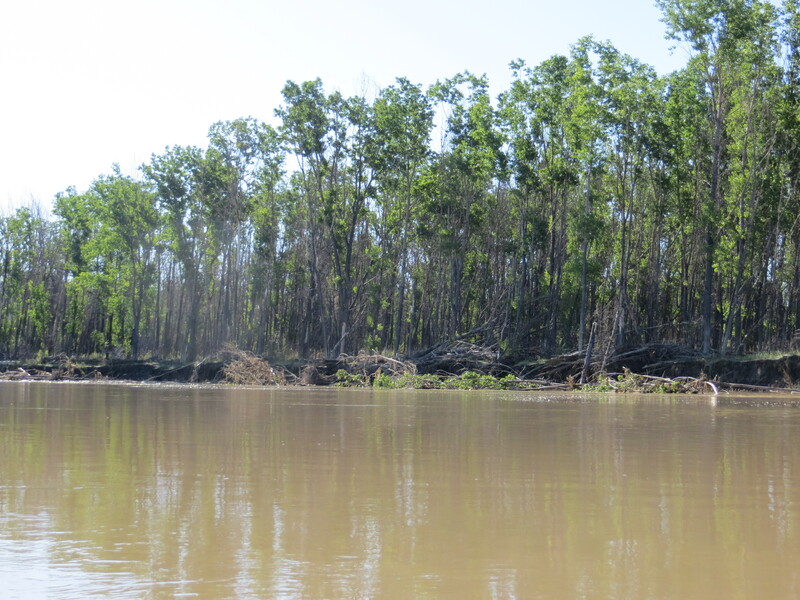 The river banks were muddy because of the recent rains. I decided I could not avoid it no matter what, so I just took off my shoes and let it squish between my toes. 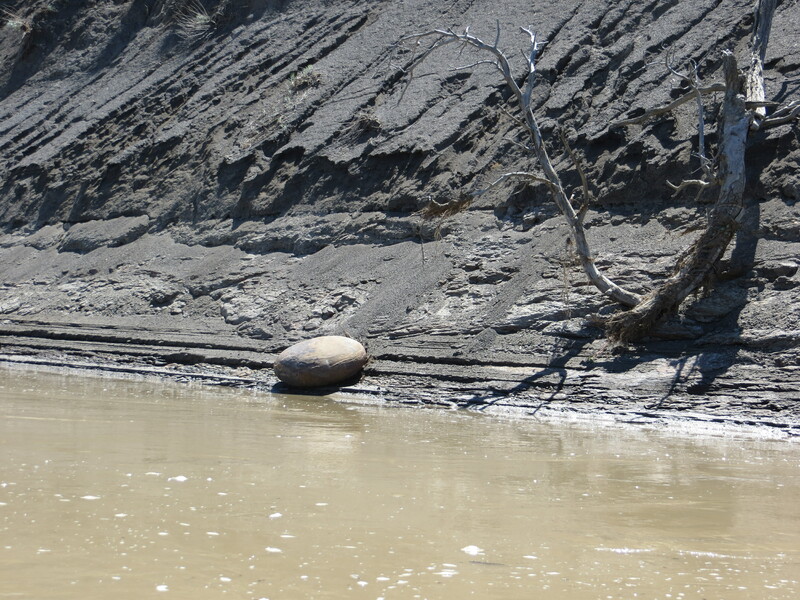 The Big Muddy’s mud is actually soft and silky and washed off the skin quite easily. What are you gonna do? You just have to deal with it. No sense in getting anxious and frustrated about it. The mud at Gist Campground was extensive. 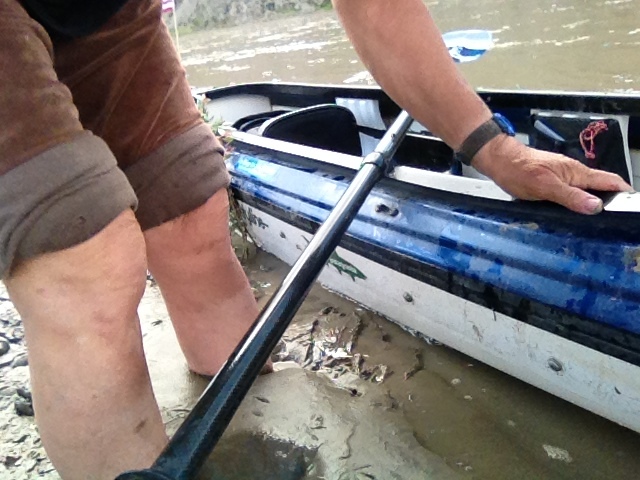 The river had flooded during all of the rain, and now the river was dropping leaving a lot of shoreline with mid-calf to knee-high mud. This is the river as it runs down towards the front of Gist Campground. I was very much isolated in this area. However, in the afternoon as I was leaving on another hike, I saw a solo canoer approaching. It is amazing I happened to see him. 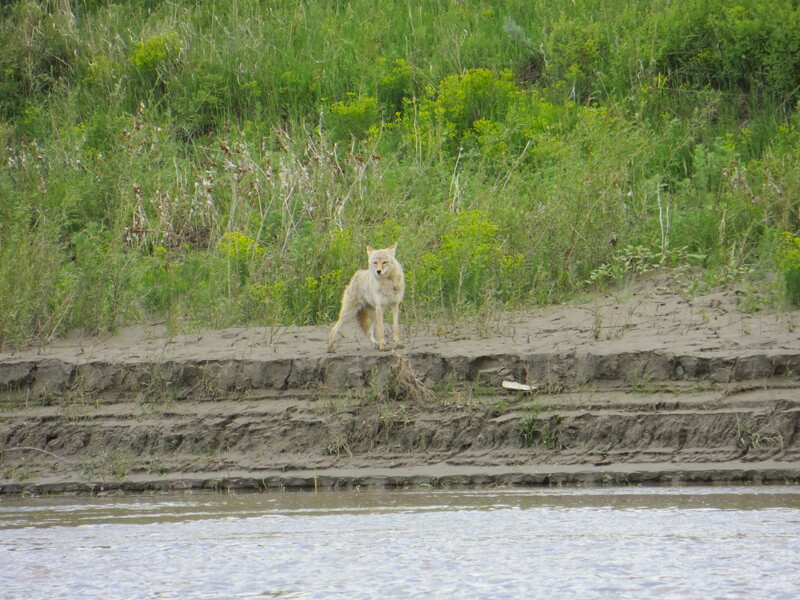 Although, I always keep one eye on the river and can spot any living thing that is nearby. Had I left a minute earlier, I may have missed seeing him upriver. I went ahead and took off on my hike. He was not there when I got back. He must have paddled on. This is the view from the campsite looking inland downriver. I wanted to walk up to the lookout in which Lewis claimed he saw the Rocky Mountains for the first time. I would have to walk a mile and a half in that direction. No problem. These are the Gist Homestead remnants just behind the campground. 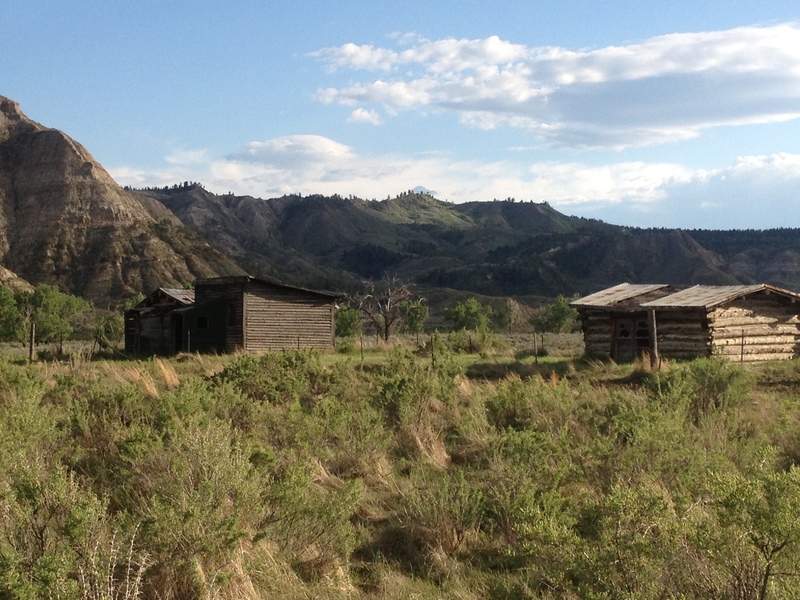 It was fascinating to see inside and imagine what life was like living out here in the 1800s. I was electrified considering these things as I used to dream about being an early settler. When I walked the mile and one half down towards the lookout hiking area, this weather blew in and looked ominous. It proved to be nothing, but I canceled my hike to the top so as to avoid thundersorm and hail trouble. After staying for two nights and several small hikes later, I moved on. The river had dropped three or four feet since I had arrived. This beached my boat fairly high above the waterline, and you know what that means? It was time to get muddy again. 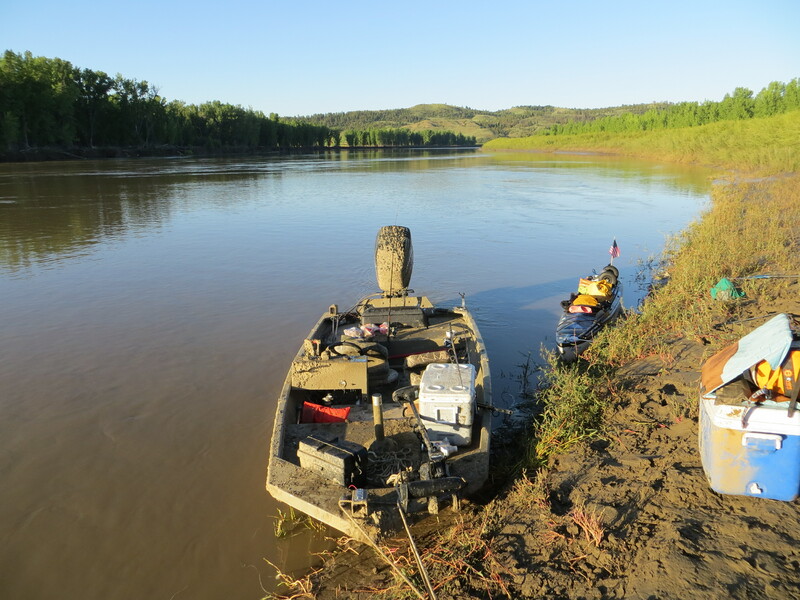 Off came the shoes and I moved the boat up the river to where I was camped since there was no difference now in the mud situation. The riverbank was muddy everywhere. I would soon find out that the mud was prevalent for miles and miles to come. 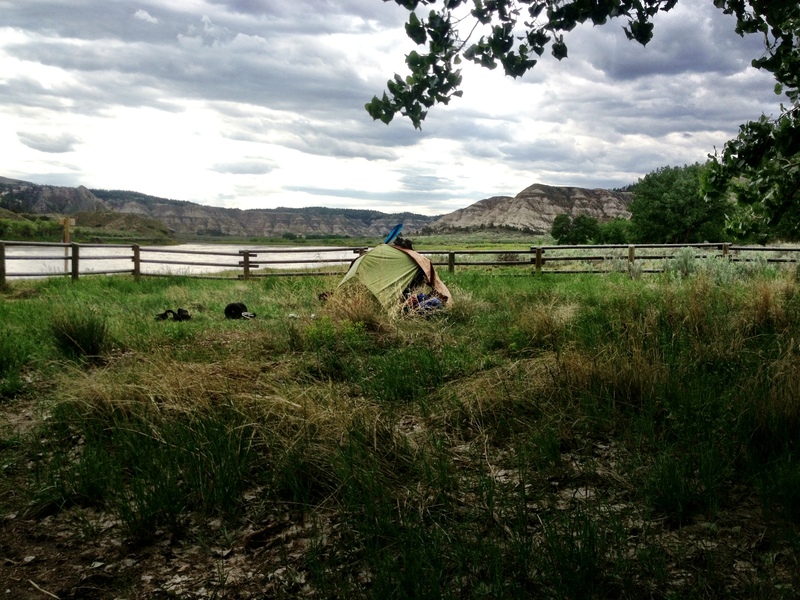 Finding campsites downriver would prove to be extremely challenging. Yes, the river dropped. I knew it would, but never thought it would look like this. You can make up your own caption for this one. 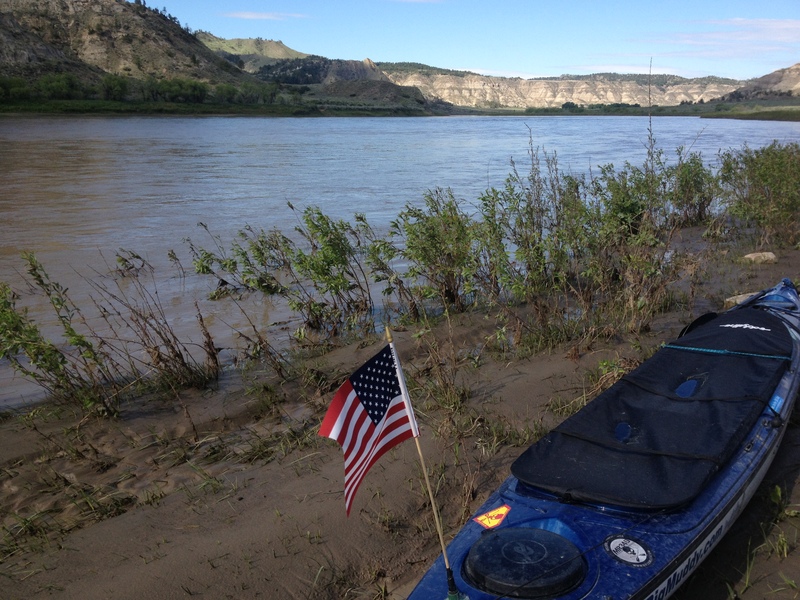 I learned about some historic events as I was actually paddling down the river. 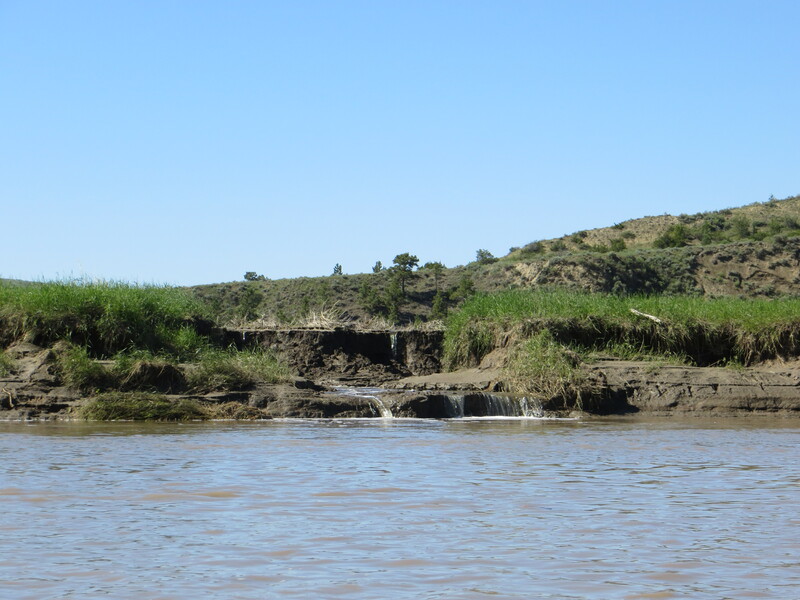 The Cow Creek Crossing was one such event. As I read about the Nez Perce Indians, led by Chief Joseph, marching towards Canada in order to escape confinement to a reservation, I was moved. 750 men, women and children, now refugees in their own country, trying to escape the American military and the inevitable tragedy that would follow. Unfortunately, they were close to Canada, but not close enough to escape. I followed their trail through this entire section and stopped every so often to just imagine where exactly they walked and what they must have looked like. I was filled with emotion. 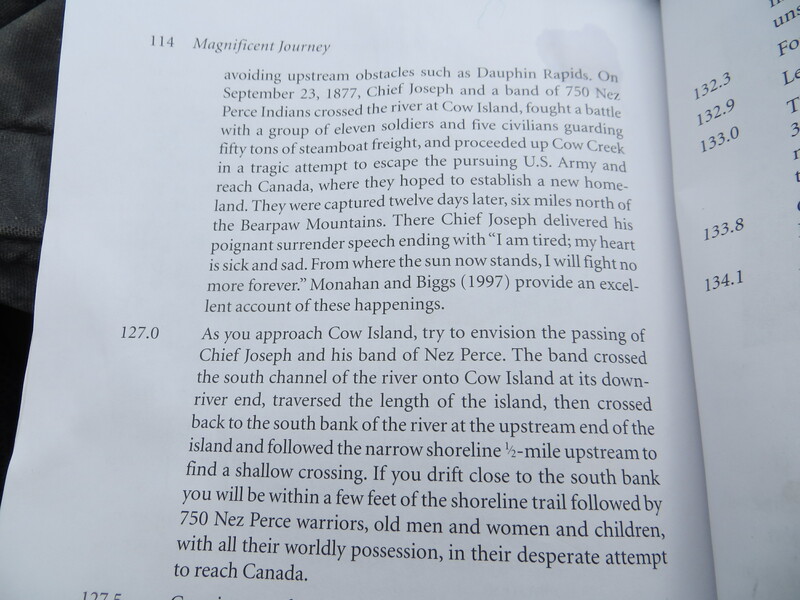 A page from Otto Schumacher and Lee Woodword’s Magnificent Journey, providing a little information about the Nez Perce Crossing of Cow Island. 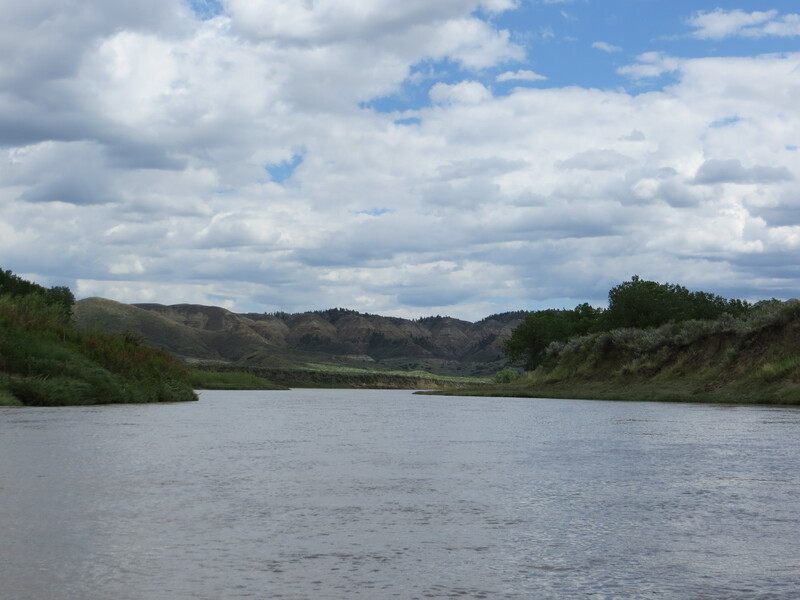 I paddled slowly past the Nez Perce National Historic Trail where, in 1877, approximately 750 men, women, and children of their “nontreaty” tribe tried to make their way to Canada to reach asylum. I saw the many water crossings they likely took, and a narrow trail along the river on which they walked near Cow Island. They were so close to freedom before they were stopped and 200 Nez Perce braves fought to defend the fleeing tribe. My heart bleeds for them. This section proved to be very melancholy for me, and unforgettable. 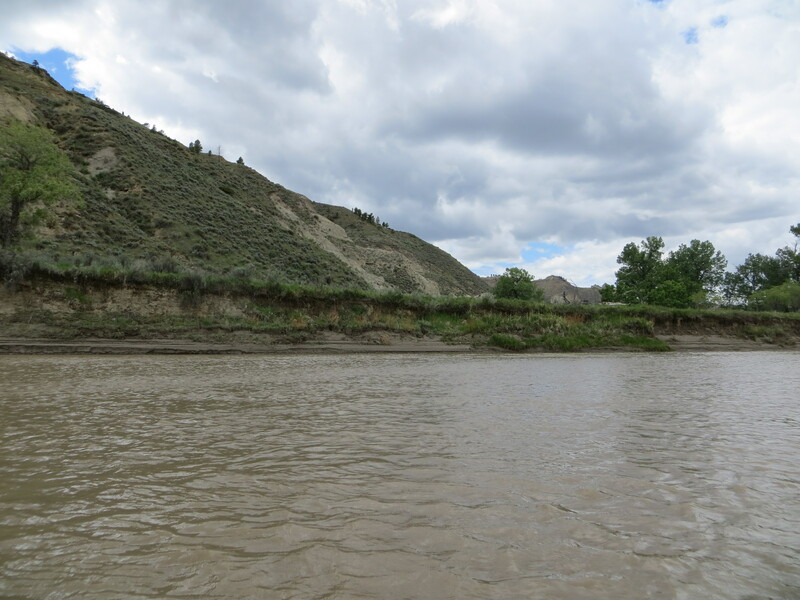 The Nez Perce likely walked along this narrow shoreline and through that flat area on their way to the Cow Island Crossing. 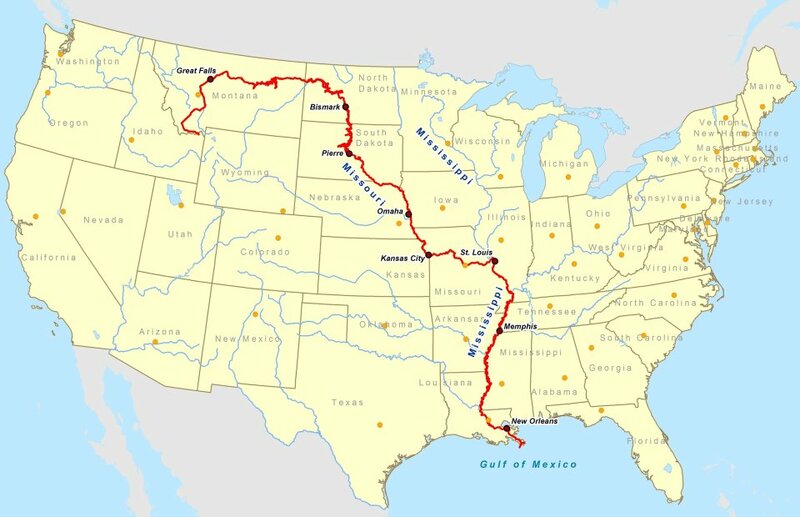 The geography of the river and mountains is still very similar, based on the map of the route they walked. 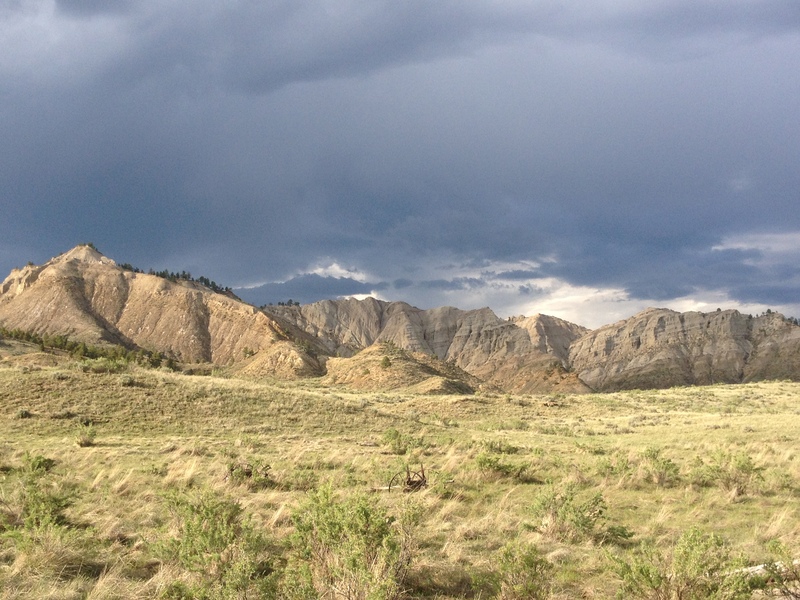 The Nez Perce Trail comes this way from those mountains and their journey involved many river crossings. The trail seems to cross right at the most narrow spots, indicating the river must still be similar to what it was it was like then. 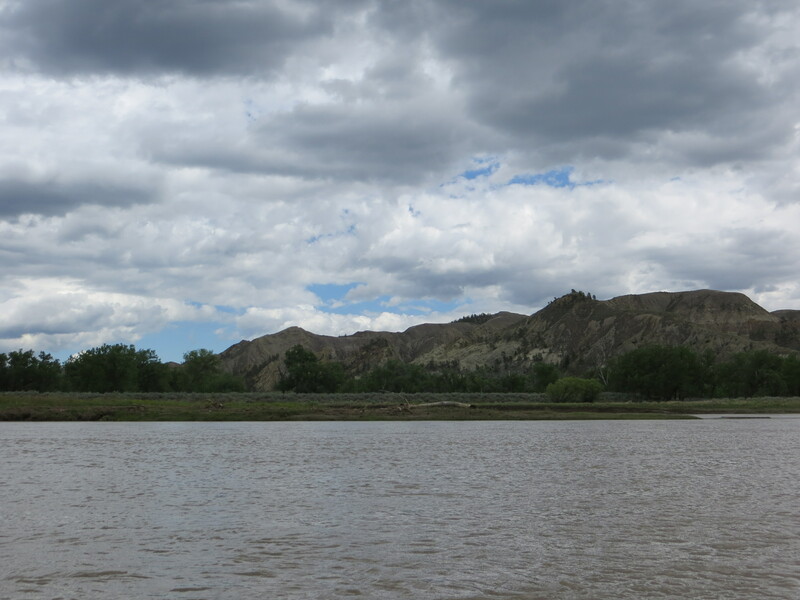 The Nez Perce crossed Cow Island and headed north towards Canada in attempt to escape the American military. My plan was to stop at the James Kipp Recreation Area. 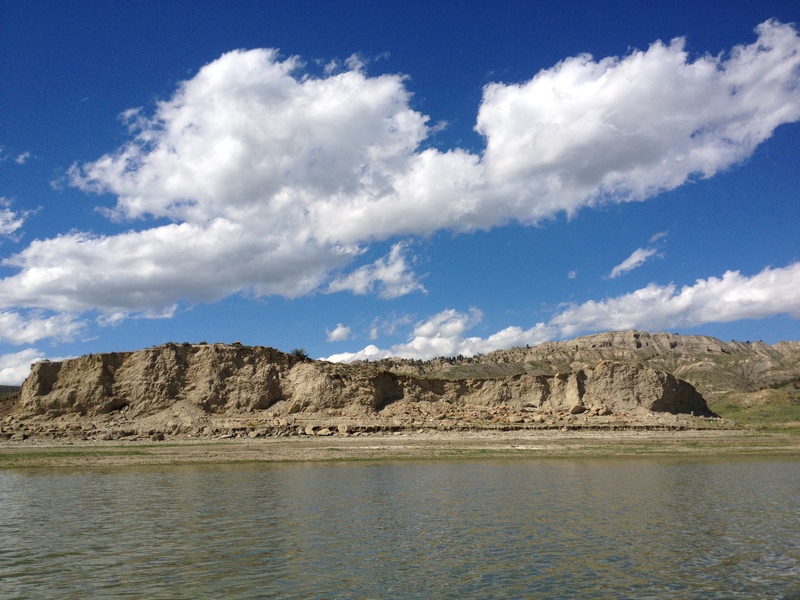 This is considered the end of the road for the Upper Missouri River Breaks National Monument. I planned on refilling my water here, and camping the night. I had no idea the flooding wreaked such havok on the campground. Not only were the roads closed just a few days previous, but the electricity was still out and that meant the water pumps were not working. A fisherman took me around to find water to no avail. But in order for him to do that, I had to get up this boat ramp. “Apparently, they have not cleared the ramp yet.” I chided. That got a good laugh. The camp host eventually came to the ramp with a ten-gallon bottle of water and filled my five gallon bottles. “What a bloody mess,” as they would say in England. It’s 4:00 PM and I’m outta here, I thought. I’ll just paddle on down the river and find myself a campsite. Oh dear. That turned out to be the greatest challenge of this trip. It took about 15 minutes for me to realize I better start looking hard. Four hours later there were still NO sites to be found, and I had stopped to investigate several areas. This was the first time I thought I might have to sleep in my kayak. OMG! Just as dusk was falling on the land, I came around a bend and saw something unusual. Three men were walking, yes walking, on the riverbank. How are they doing that?! I exclaimed to my brain. Is it not muddy in that spot. I paddled in a straight line over to their boat, and them. I made friends fast. Actually, I had no intention of going any further. Thankfully, Eli, Brandon, and Travis turned out to be river angels, river angels from Roundup, Montana. Eli, left, and Brandon on the riverbank. They had been paddlefish fishing there all day long. They stomped out a sizable trail down the riverbank. I’ve never been so happy to see anyone in my life! Travis, Brandon’s older brother. These guys turned out to be so wonderful! 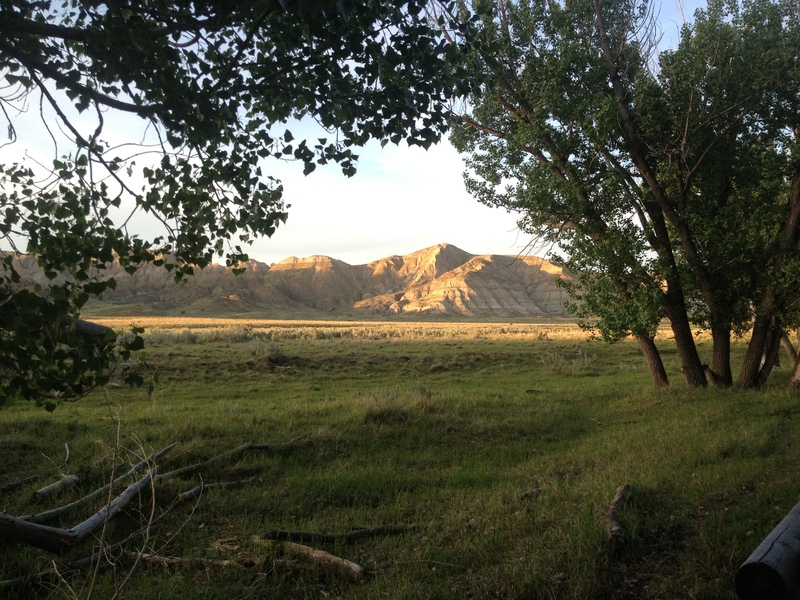 Soon, darkness was upon us, and Eli helped me carry my gear down the bank, through the willow forest, and up the hill where I set up my tent with a gorgeous view of the river. I went from rags to riches, and was thrilled. The boys ended up camping at their truck that night, which was located at the top of the hill, and we had a fire and passed around a bottle of JD (only a couple of times). When in Montana, you do as the Roundup Boys do. I was so happy! And, Brandon gave me his Leatherman to take with me. Now, THAT’S special! 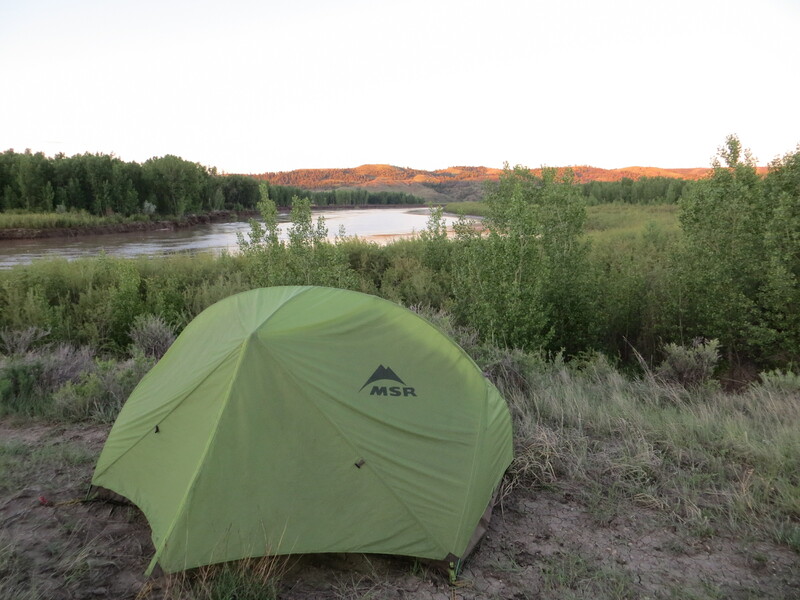 Eli helped me carry my tent and gear down the bank, through the willows and up the hill where I set up my tent overlooking the river. I was so thankful. He also explained to me that the screaming animal I kept hearing during the evenings was merely a toad. Whew! 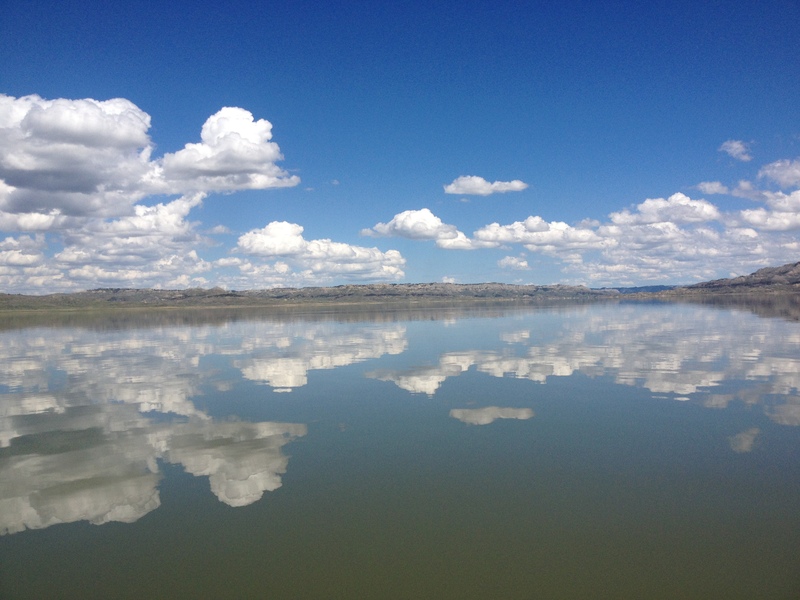 I had a long day of paddling the next day in order to get to Fort Peck Lake. I rose up at sunrise and was in my boat at 7:00 AM. I waved to Eli from the shore. I was sad to leave these river angels. 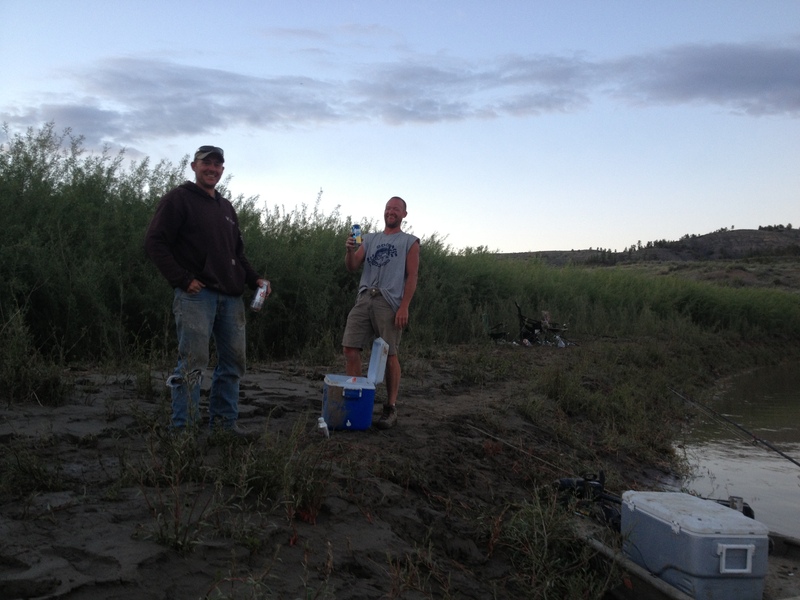 The RoundUp boys’ fishing boat and Blue Moon on the shore of our oasis. 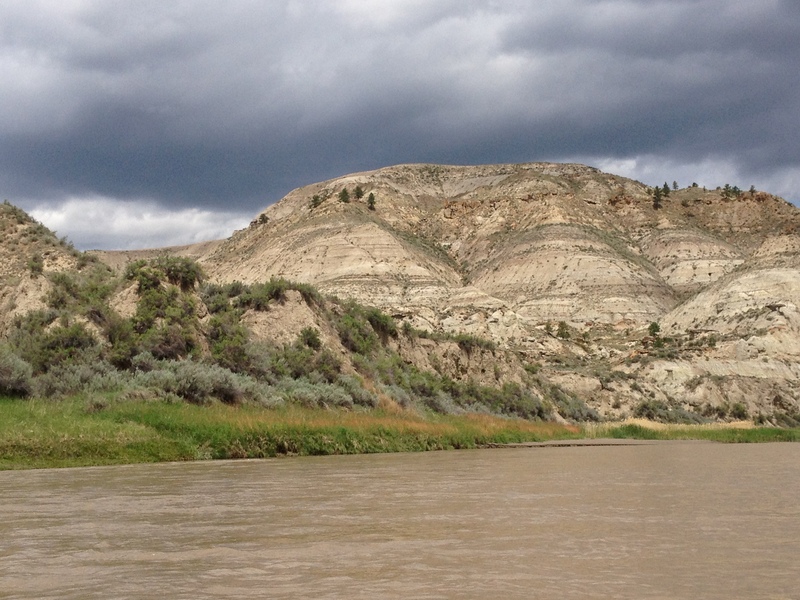 It is so easy to get attached to kindred spirits that share their life with the river. There is a bond that is undeniable. We share riverblood. 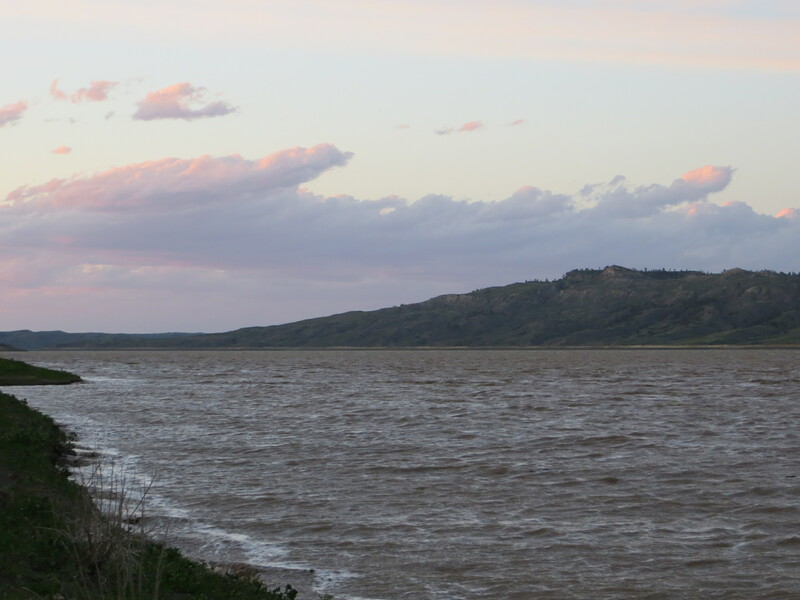 43 miles later this day, I arrived at Fort Peck Lake. I had had no internet service for nearly a week, and would not for almost another. I found myself immersed in mountainous wilderness. I was in heaven. 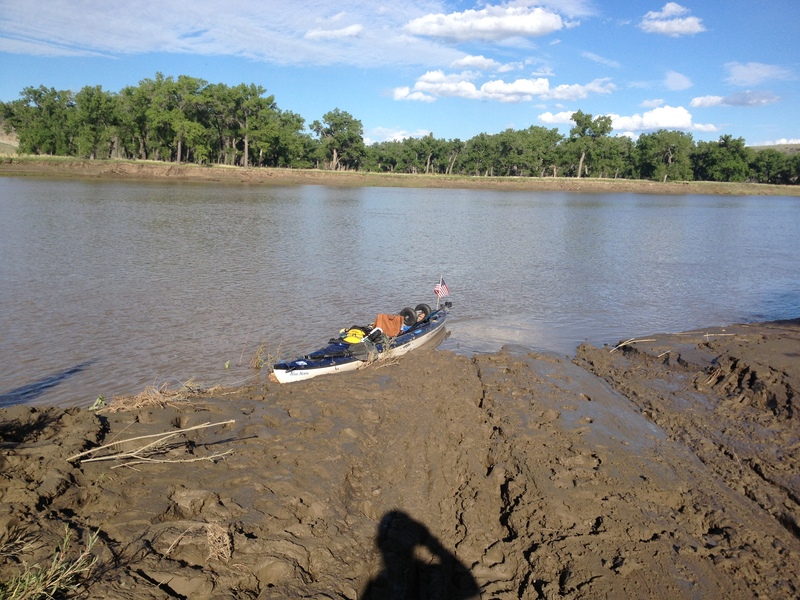 Check in at LoveYourBigMuddy Expedition on Facebook for current events.